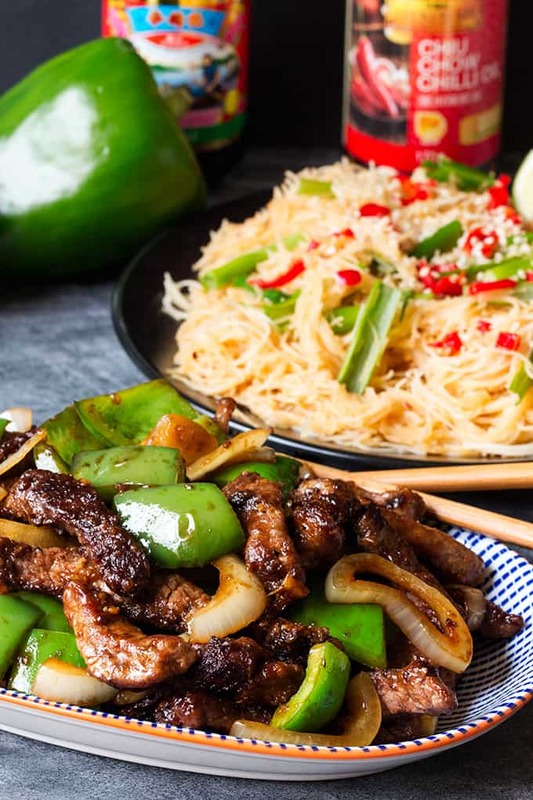 Today’s Black Pepper Steak with Chilli Lime Noodles post is sponsored by my friends at LKK. Check out their Summer BBQ competition site for a chance to win flight tickets to Hong Kong amongst lots of other prizes at www.LKKcarnival.com. Oh my! 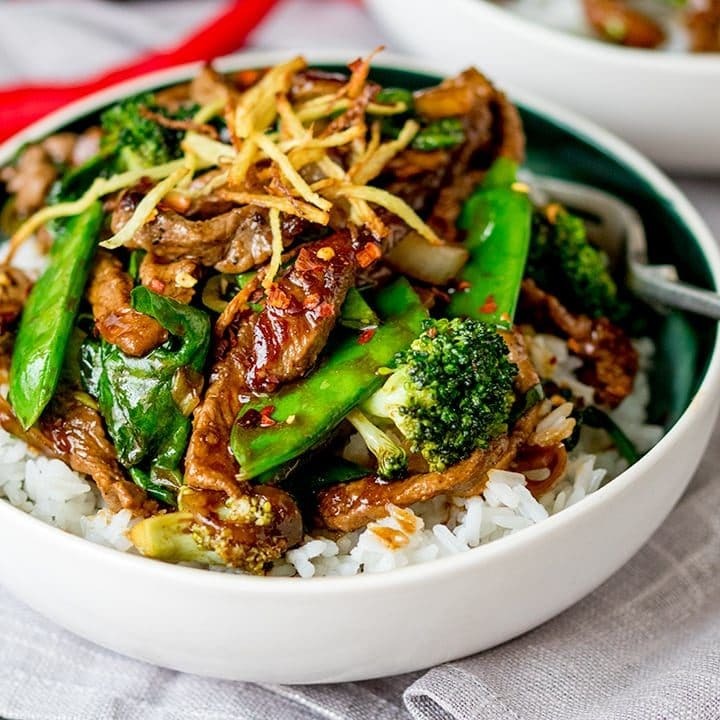 Crisp fried steak strips with crunchy vegetables in a black pepper and oyster sauce. Serve it with noodles cooked in chilli oil and lime for a meal that will get your taste buds tingling! Honestly, give me any excuse to cook Chinese food, and I’m in the kitchen with wok in hand before you start your next sentence. When LKK sent me a box of their delicious sauces to try, I couldn’t wait to do some experimentation. Their oyster sauce is a kitchen staple for me, but I didn’t realise just how many products they have (plus, they’re on discount at the moment in Asda and Tesco!). Now, I may have mentioned one or twice that Chris is a dedicated carnivore, so I decided to give him a treat and go down the steak route. Even better, I went with crispy fried steak strips! 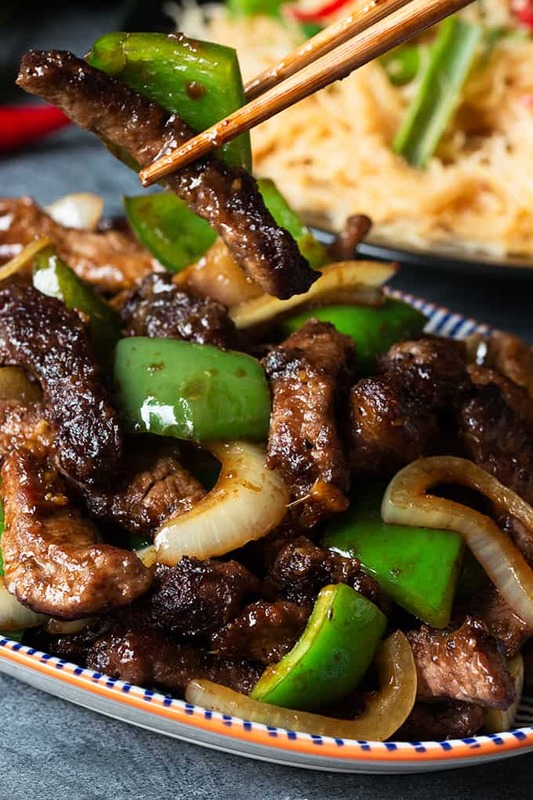 Have you ever been to a restaurant and ordered crispy beef, only for it to come out like beef flavoured strips of nothing-but-crunch? No meaty bit in the middle? Disintegrates in your mouth immediately? How disappointing!! No, here we’re talking proper strips of good-quality steak. Dark brown and crunchy on the outside, and rich and tender on the inside. The sauce is salty, sweet and a perfectly garlicky. You can add some chilli flakes to it if you wanted, but it really doesn’t need it (plus those chilli noodles are hot!!). 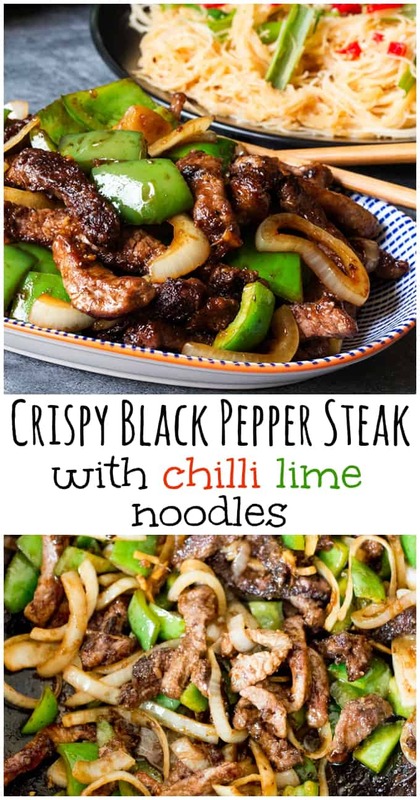 Black Pepper Steak with Chilli Lime Noodles - this recipe is guaranteed to get your taste buds tingling! Toss the steak slices with the cornflour, 1 tsp of black pepper and the salt. 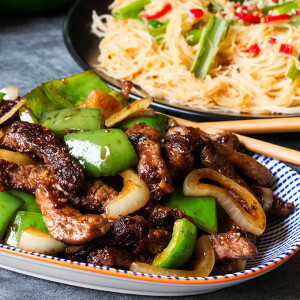 Heat the 3tbsp vegetable oil and the sesame oil in a wok until hot, then fry the steak until dark and crisp (you may have to do this in two batches). Don’t stir the steak too much, or it won’t crisp up. Spoon out the steak and place on a paper towel to remove any excess fat. Cook the vermicelli noodles as per the pack instructions (usually this means placing in just-boiled water for 3 minutes). Drain and rinse in cold water. Put to one side. Heat the remaining vegetable oil in the wok and add in the onions and peppers. Stir fry for 3-4 minutes until starting to soften. Add in the garlic and ginger and cook for 1 minute, then add in the soy sauce, sherry, oyster sauce and remaining black pepper and stir. Whilst the oyster sauce and veg are heating through, cook the noodles. Heat the chiu chow chilli oil in another large pan or wok. Add the noodles and spring onions and heat through whilst moving the noodles around the pan with a spatula. 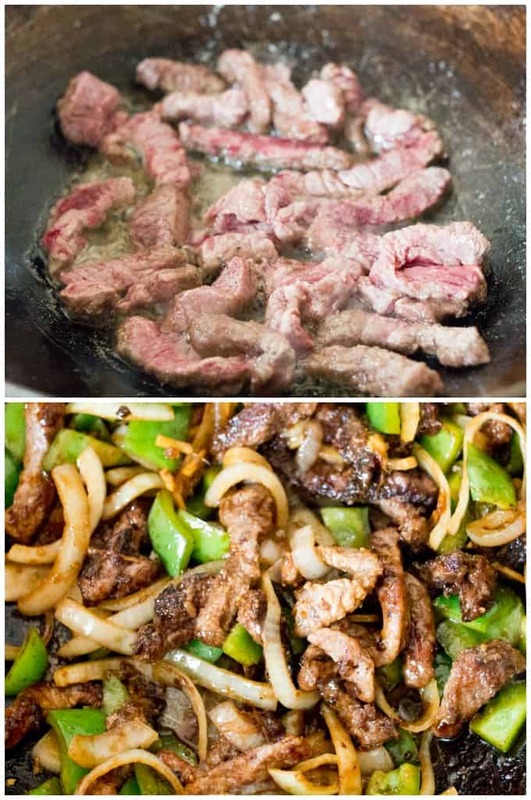 Mix the soy sauce, lime juice and sugar and pour over the noodles. Allow to heat through, giving the occasional stir to stop the noodles sticking to the pan. Add the steak back to the wok with the peppers and onions and heat through. 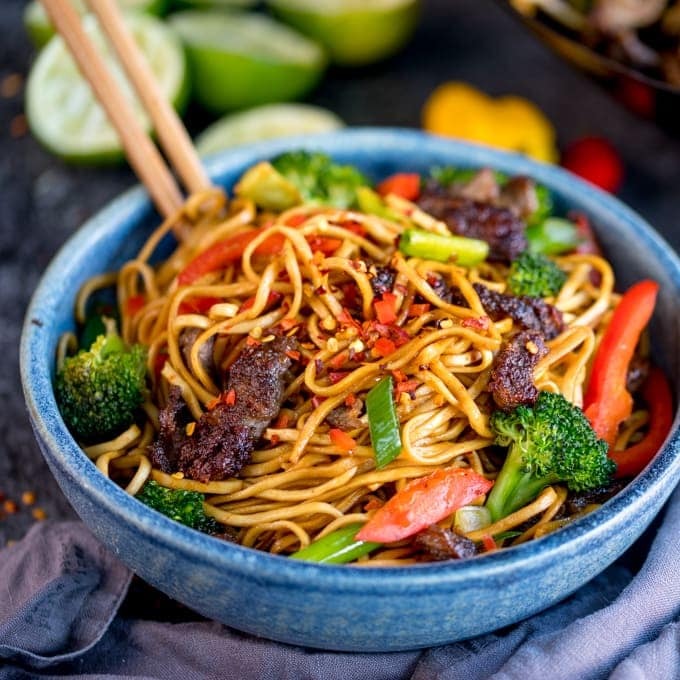 Distribute the noodles between four plates, then top with a lime wedge, chopped chillies, and a sprinkle of sesame seeds. Serve with the steak and vegetables. 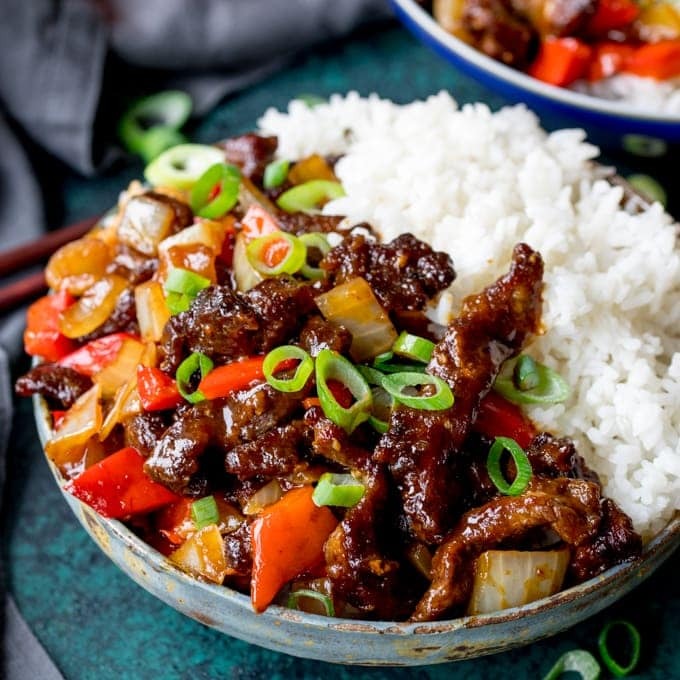 I was searching everywhere online to find a flavorful beef + stir fry recipe, and I think I found a winner!!! Plus I have all these ingredients already so I can’t wait to whip this up tonight! Thanks for sharing this! I’m going to have to tell my boyfrined I met someone else…this black pepper steak LOL! That beef looks amazing, and those noodles, well I think I need all of this in my life. I’m so sad that my wok is temporarily packed away why we live in our tiny apartment temporarily. With a low powdered electric stove. LOL – can’t wait to make this steak!! Perfect for Friday night supper, so much nicer than a takeaway. Hi Carol, argh I’m torn! I was writing putting the nutritional content on the recipes about a year ago, but I didn’t feel it provided a lot of value – particularly on the naughtier foods. I asked whether readers would like me to keep including in, but only 1 or 2 people said they used it. I may have a solution that could help you with my recipes and other recipes you find online too. Have you heard of Yummly.com? 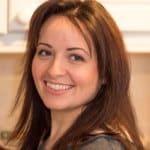 I’ve started using it recently, and it’s a great way to group your favourite recipes from different blogs together. It also works out the nutritional information for you. I added a ‘yum’ button to the top of my blog posts last week. 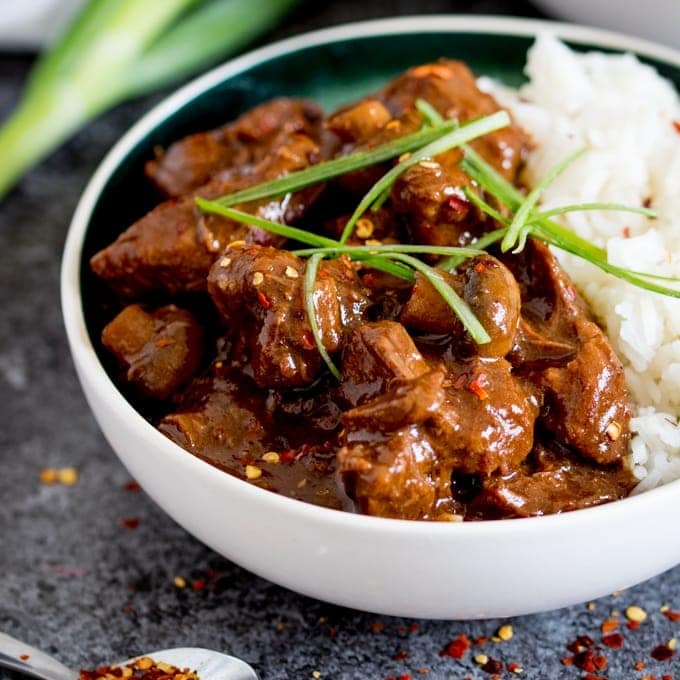 I think you need a yummly account (it’s free), but if you click the yum button, it adds the recipe to your recipe box and works out the nutritional info straight away. It’s worked it out at 460 calories per serving.